For many women the secret to beautifully styled hair begins with styling essentials that achieve a salon look from the privacy of home. Lady Jayne ensures perfection every time and has created the ultimate blow-drying brush to create everything from curls and waves to straight styles or maximum volume hair. Lady Jayne Ceramic Styling Brushes are professional heat activated brushes for faster styling, which sets styles for longer. If time is your concern then a Lady Jayne Ceramic (thermal) brush is what you need. The ceramic coating is heat conducting and as this gets hot from the heat of your dryer this will increase the heat that is drying your hair, it works not only on the surface of the hair but internally as well. 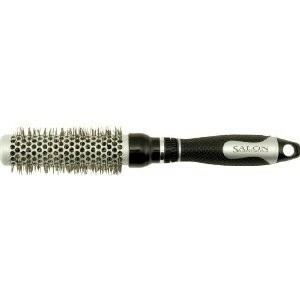 The ionic bristles will reduce frizz and add lustre and shine to the hair. The vented brush head will allow maximum airflow giving added body and volume. The size of the brush you need depends on the length of your hair and the effect you want to create. This Lady Jayne Ceramic Styling Brush is a 25 mm diameter brush and is suitable for medium to longer length hair. As a general guide your hair needs to be long enough to wind around the brush once. Always detangle and section the hair using a comb. Use the brush to style the hair. To help set the style allow the brush to cool for a few seconds before removing the brush. Tight turns will create a curly look, slight turns will product a smoother style. Always roll hair loosely and neatly to avoid tangling. Do not wind the hair more than once around the brush. Always unwind hair from brush - do not pull brush out. fab for blow drying hair. Easy to use, works really well and heats up to aid styling. Price is good as it is a great long lasting brush. Hair looks sleeker and perfectly styled after use. Ceramic so it heats up nicely when drying.